I’ve just finished a new painting in my In Our Veins series. The title is Intertwine and it is an acrylic on canvas, 4″ wide by 4″ high. I really wanted to paint a pair of bighorn sheep for this one so I had to alter the horns a bit, plus added curly hair. You can view this piece as well as other paintings in the series on my website: https://amyguidry.com/intertwine.html. If you missed the opening of “The Revival” at Cactus Gallery in Los Angeles, there will be another event tomorrow. The gallery will be open for the 11th Frogtown Art Walk on Saturday, September 22nd from 4-10pm. It is a community festival that stretches 2 miles along the LA River. Numerous venues will host pop-up art exhibits, food selections, stages and performance spaces, all for free. 37 venues (Cactus Gallery, 3001 N. Coolidge Ave. LA CA 90039 is #29 on the map), 50+ artists, 3 stages with music, a “literary lounge”, an interactive light installation stretching ½ mile along the LA River, pedi-cabs, and more. My painting Renew will be featured as part of “The Revival,” an exhibit which explores life, death, rebirth and growth represented with natural imagery. 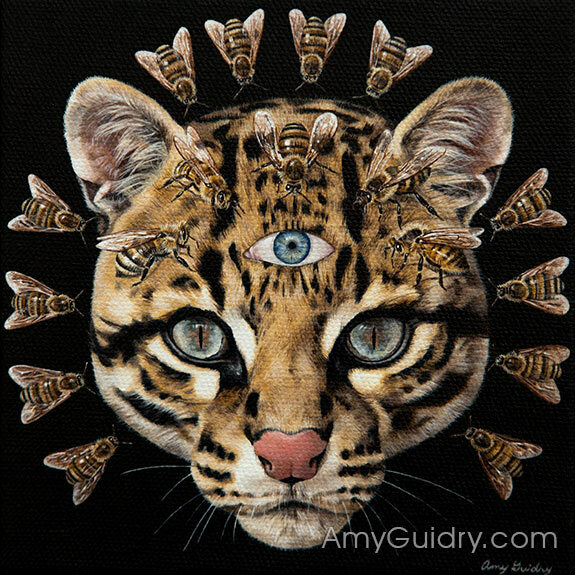 You can view Renew online (and purchase ahead of the event) here: https://cactusgalleryla.com/collections/the-revival-2018/products/renew-by-artist-amy-guidry. I’ve been painting a few big cats lately (I’ve been a fan since I was a little kid) and am happy to see some find new homes. Bestow and Interconnect have both gone to the West Coast- Seattle and Los Angeles. Both paintings are acrylic on canvas, 6″ wide by 6″ high. 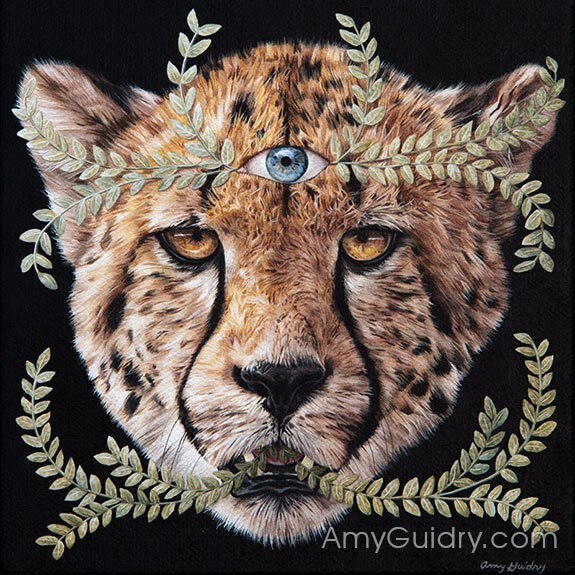 There are currently two big cat paintings available: Renew is part of Cactus Gallery’s current exhibition available online here: https://cactusgalleryla.com/collections/the-revival-2018/products/renew-by-artist-amy-guidry and Transcendental is available online through Modern Eden Gallery here: https://www.moderneden.com/collections/available-artwork/products/transcendental. I’m happy to reveal my new painting for Cactus Gallery’s The Revival exhibition. It’s titled Renew and is an acrylic on canvas, 6″ wide by 6″ high. The theme of the show deals with life, death, rebirth, and regrowth through natural imagery which is very much in line with my work. Renew is in keeping with my ongoing series, In Our Veins, which explores the connections of all life forms and the cycle of life. Each animal, and each plant, serves a role in the life cycle, together forming the delicate balance of nature. The human third eye in this piece refers to our connection to all of nature, while the vines refer to the cyclical process of sustenance, the transfer of energy, and renewal. You can view Renew on my website here: https://amyguidry.com/renew.html. 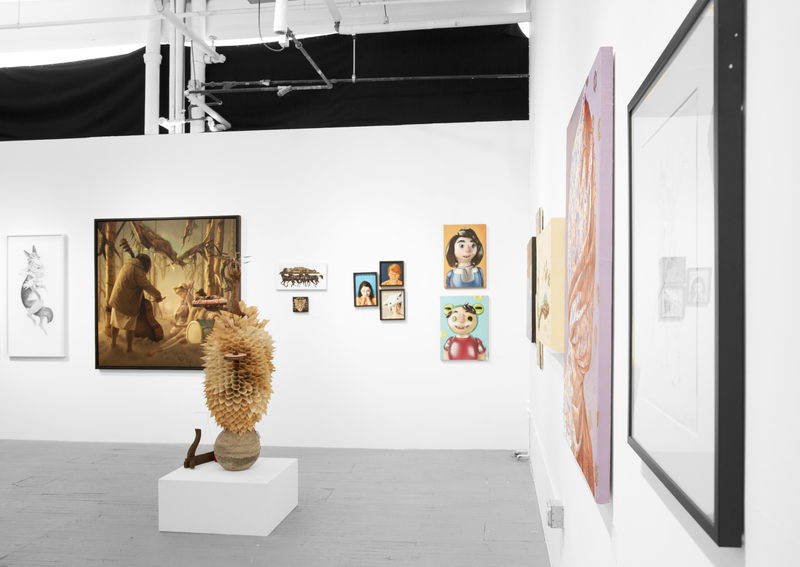 For sales, contact the gallery director Sandra Mastroianni at sandra@cactusgalleryla.com or 323-801-8669. Making a lot of progress on my current painting for Cactus Gallery’s upcoming show. I was invited to create a piece for “The Revival,” an exhibition exploring life, death, rebirth and growth represented with natural imagery. I’m currently working on the little leaves in this piece. Will post the finished painting soon. If you’d like to be updated when it is finished, sign up for my newsletter here: https://amyguidry.com/contact.html. 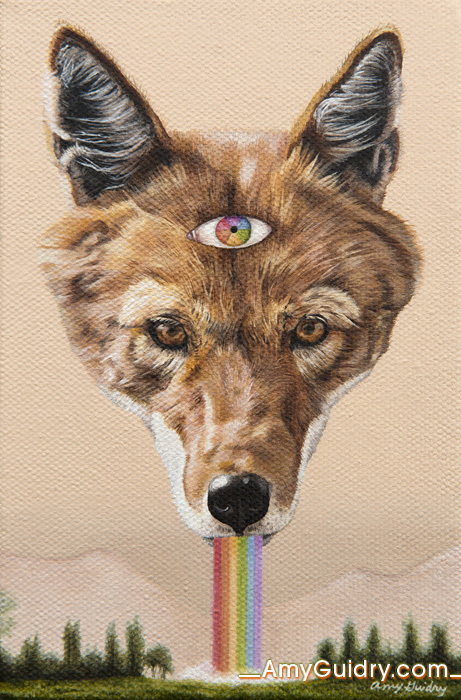 “The Revival” opens September 8th at Cactus Gallery in Los Angeles. I was recently invited to create a piece for the upcoming “Ho’olaule’a” exhibition opening at Cactus Gallery in Los Angeles. The exhibit celebrates endangered species (Ho’olaule’a is Hawaiian for celebration), and I chose to paint the Ethiopian wolf. Ethiopian wolves are the only wolf found in Africa. They are the rarest species of dog in the world and the rarest carnivore in Africa. There are less than 450 left in the wild. They live in close-knit packs of 3-13 adults, but unusually for wolves, they hunt alone. One of their biggest threats comes from habitat loss due to agriculture. 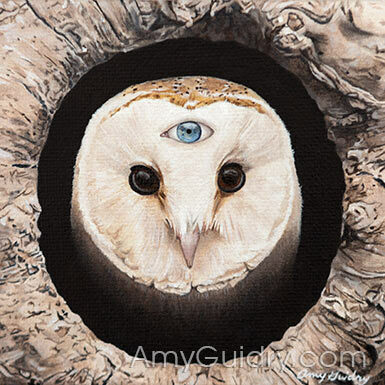 The title of my painting is Hope and it is an acrylic on canvas, 4″ wide by 6″ high. 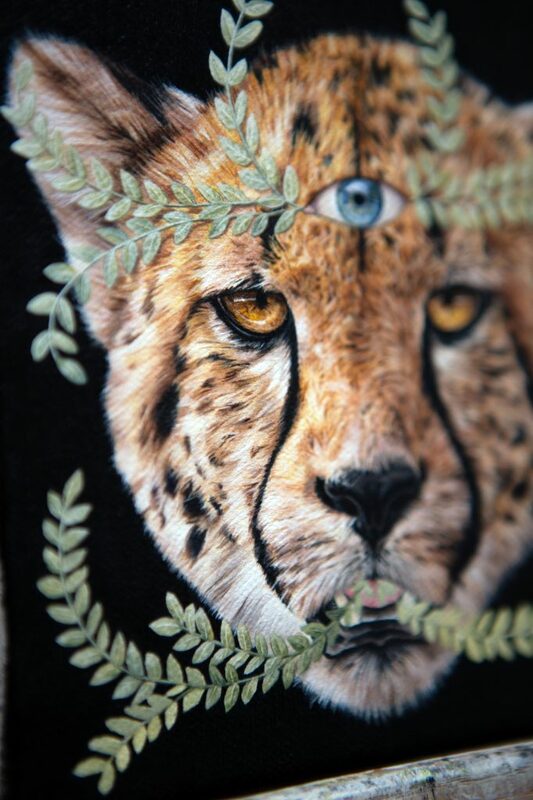 The human third eye refers to our connection with nature: the we see ourselves in animals as well as seeing the world through their eyes. The rainbow is a symbol of hope, hence the title, and serves to inspire us all to keep working towards a better future for all of nature. The “Ho’olaule’a” exhibition opens this Saturday, May 12th, 6-9pm and will remain up through June 2nd. More details here: https://cactusgalleryla.com/. For pre-sales, contact Sandra at sandra@cactusgalleryla.com. 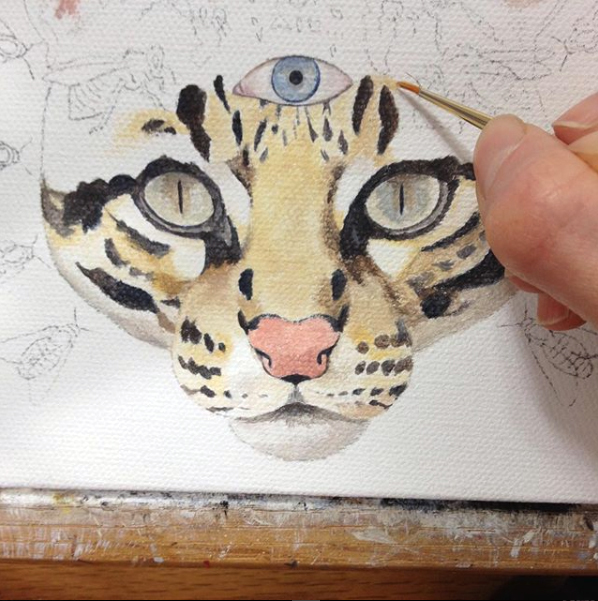 Currently working on a new painting for WOW x WOW’s upcoming online exhibition, “Super Reverie.” I decided to paint an ocelot for this one. When I was a child, I was such a fan of ocelots and big cats that I could identify them solely by the markings on their fur. While the overall ocelot population is currently considered stable, there are only 30 left in the United States in southeast Texas. They used to be found east in Arkansas and Louisiana, as well as throughout Texas and in Mexico. Now they are found only in extreme southern Texas, northeastern Mexico, in addition to Central and South America. Hunting and habitat loss are their biggest threats, which is why a border wall could hinder their roaming for food and breeding. These are progress photos of the beginning layers of paint as well as much more development of detail to the hair and eyes. 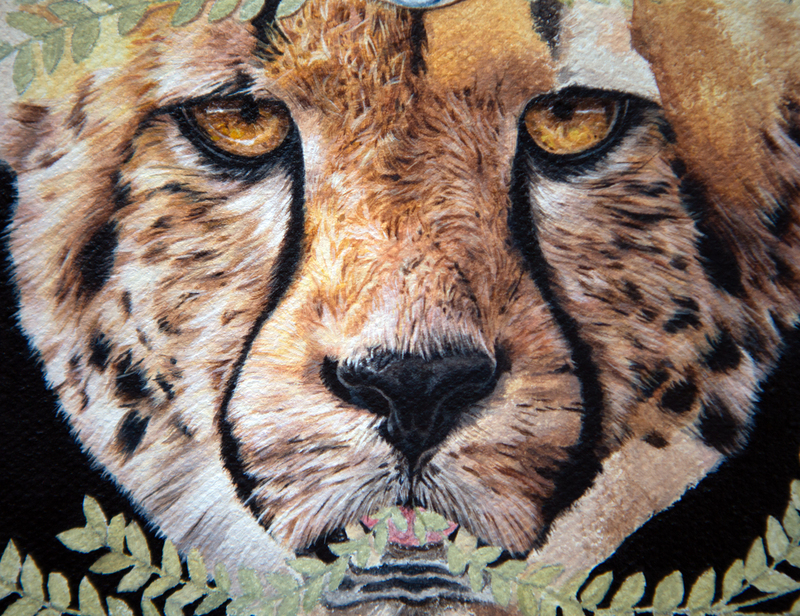 The painting is an acrylic on canvas, 6″ wide by 6″ high. Sign up for my newsletter if you’d like to know when the finished piece goes online: https://amyguidry.com/contact.html. My latest painting in the In Our Veins series is now online. This piece was created for Gristle Art Gallery’s “Floriography” exhibition going on now through May 5th, 2018. It’s titled Interconnect and is an acrylic on canvas, 6″ wide by 6″ high. 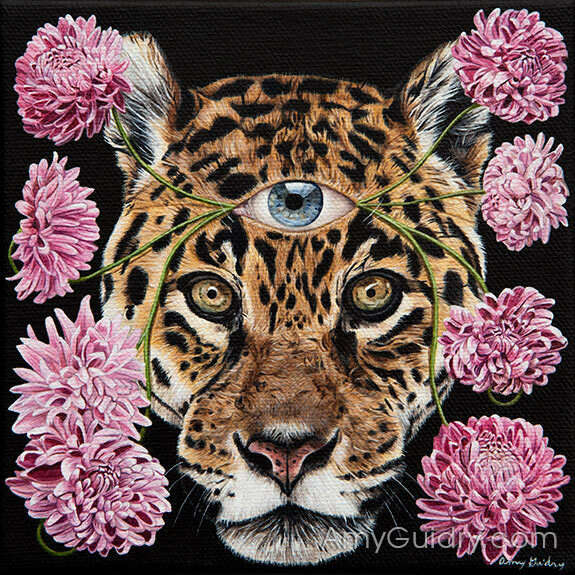 The human third eye refers to our connection to all of nature, both flora and fauna. 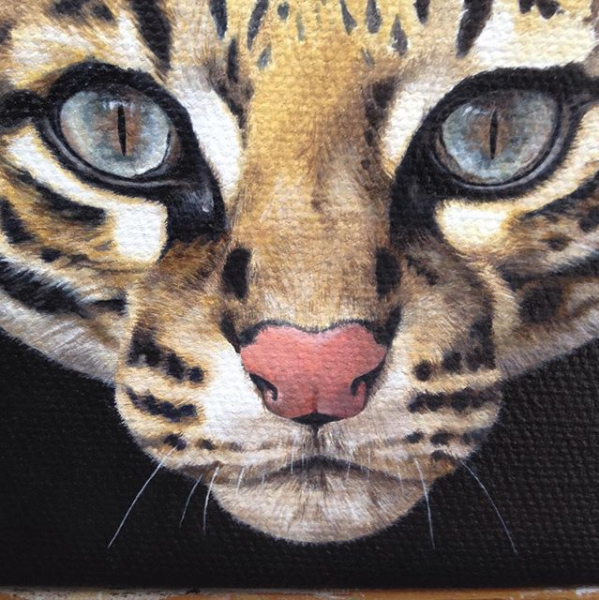 I chose to paint a jaguar for this piece- one of my favorite big cats ever since childhood. And an appropriate subject for a floriography-themed exhibit as their black spots are referred to as “rosettes” because of their rose-like shape. Jaguars are mainly found in the Amazon or remote areas of Central and South America. They haven’t reached full endangered status -yet- but their population is in decline and they are listed as Threatened. “Floriography” is on view at Gristle Art Gallery in Brooklyn, New York now through May 5th. You can also view the exhibit online here: https://www.gristleartgallery.com/floriography.html. This is a sneak preview of sorts of my new painting Interconnect which will be part of Gristle Art Gallery’s “Floriography” exhibition. It was selected as a promotional image for the show, so I’ll be posting the full image (sans text) once the exhibit opens. If you are or will be in Brooklyn, New York anytime soon, the exhibition will be up March 10th through May 5th. There will be an opening reception this Saturday, March 10th from 7-9pm. More details here: https://www.gristleartgallery.com/current.html. My small painting Sight has just found a new home. This was the first time I’ve painted a barn owl, and I was very happy with the results. I especially enjoyed painting the contrast of the dark eyes against the white feathers. The human eye on his forehead refers to our connection with all of nature. 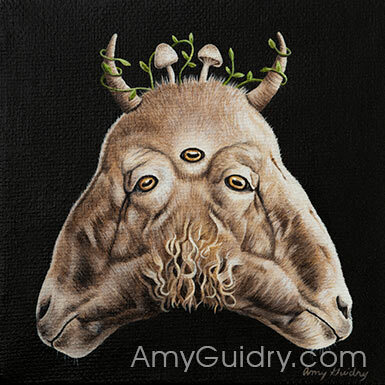 This piece is part of a larger series titled In Our Veins, which you can view online here: https://amyguidry.com/gallery.html.